My very first Con was in 2014 and immediately I was hooked. 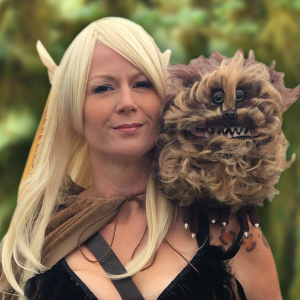 I entered my first cosplay contest the following year at RICC and won Best in Show for my Dark Crystal Skeksis, Fizzgig and Gelfling Since then I’ve learned so much about what this kind of creative outlet can do for my happy. Using my skills as a home Haunter (I build a haunted house in my yard every year for the month of October), my Bestie/Build Buddy/Handler/Anti-Spaz Presence Lydia Rossi, and a “let’s just see if it works” attitude I’ve been able to create some things I’m incredibly proud of. You may have seen the replica of Olmec from Legends of the Hidden Temple (made for ESCC) , Alf, or my Labyrinth group at con. More often than not I can be seen or heard with my puppets who almost all speak with their own voices using my reprogrammable VFX PuppetMaster sound box. I’ll always be most enamored with the nostalgia, awe and glee one of my builds puts on people’s faces. That is what it’s all about (that and the ‘I bet I can make one’ challenge). I can’t wait to meet more people and learn new techniques or mediums. Crafty crafters crafting makes my Kit heart warm! Build on!